Never an admirer of television, John Cassavetes would look back on his run as star of the single-season series Johnny Staccato, a 30-minute crime drama for NBC, as a time of “games – painful and stupid, falsely satisfying and economically rewarding” (1). Certainly the series in question, which ran from September 1959 until March the following year, can be easily placed alongside the long list of the man’s “money jobs”: playing Karonos to William Shatner’s Alexander in a television version of Alexander the Great (1968); making a cameo appearance for United Artists in If it’s Tuesday, This Must be Belgium (Mel Stuart, 1969), which at least provided a European holiday; appearing as head of a SWAT unit, and having to answer to chief-of-police Charlton Heston, in the sniper thriller Two-Minute Warning (Larry Peerce, 1976) for Universal. These are not, of course, respectable examples of film craftsmanship, and Cassavetes barely registers in them ¬– nor did he seem to want to. In interviews Cassavetes was always upfront about the basis for his accepting these kinds of jobs – painful and stupid, maybe, but increasingly lucrative and, as the 1970s wore on, increasingly first-rate. Some of them, like Paul Mazursky’s Tempest (1982), represent Cassavetes at his best – though not, of course, within the borders of his preferred vocation. An artist who ceaselessly self-identified not as an actor-director but, simply and forcefully, as a “filmmaker”, Cassavetes was in fact a highly effective screen performer. An ideal, memorable villain for Roman Polanski and Brian de Palma (in, respectively, Rosemary’s Baby  and The Fury ), Cassavetes was nominated for a supporting actor Oscar for Robert Aldrich’s The Dirty Dozen (1967), a paradigmatic basic-training film. Firmly identified with the American independent cinema movement he helped create, Cassavetes must have gleaned something about genre from his many associations with mainstream Hollywood, and for good reason: to upset a formal convention, you must first understand it. With this in mind, a perusal of Cassavetes’ oeuvre reveals some classic generic products: the two horror films, Aldrich’s blockbuster war picture, but also Don Siegel’s The Killers (1964), remade from Robert Siodmak’s 1946 thriller, and John Badham’s social-protest weeper Whose Life Is It Anyway? (1981). It’s interesting to read these mainstream films against Cassavetes’ deliberately genre-upending directorial efforts, while in the process noting that the two may seem so disparate as to involve two very different (and rigidly separate) Johns. But, surprisingly, Cassavetes was, as a filmmaker, responsible for something that even now feels prototypically mainstream – four episodes of Johnny Staccato, his first outing as a director. Cassavetes had already been working on Shadows (1959), his first feature, for several years when he accepted the role of Johnny. Having suffered through an unsuccessful early screening of a version of that film in 1957, he was desperately in need of money for re-shoots. 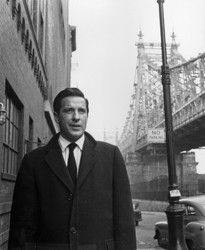 Because Shadows was set in New York, and because the actors lived in that city, Cassavetes must have viewed NBC’s offer as representing a kind of ideal situation. Johnny Staccato, a meditation on the television crime genre, was to be firmly grounded in New York, and shot partially on location, like Shadows. An extraordinary decision even by today’s standards, NBC’s eagerness to contractually allow Cassavetes to direct a number of episodes must have seemed like icing on the cake. A telefilm series, like the then-new The Twilight Zone, Johnny Staccato was intended to be uncompromising in its excavation of the dissolute underbelly of New York City. Viewed today, its unpleasantness may seem too much for the pseudo-documentary form to support, for the world of Johnny Staccato is per expectation for the historically xenophobic institution of television – which is to say, almost completely lilywhite. When a person of colour does show up in the series, it’s typically as a villain or, at best, as a secretive outsider (as in “The Shop of the Four Winds”). Deeply problematic but suggestive of Cold War paranoia, this representational tactic extends to the penultimate episode of the series, “Swinging Long Hair”, in which Johnny, dealing with a mistaken identity plot, must confront both angry gunmen and the true nature of Eastern European refugees. Stanley (George Voskovec) and Mina Kaye (Celia Lovsky) are the mysterious strangers at the center of “Swinging Long Hair”. Having escaped the Iron Curtain, Stanley, a former concert pianist, and Mina, his supportive wife, are struggling to make a life in Greenwich Village, but find only threat and menace. Like most episodes of Johnny Staccato, “Swinging Long Hair” introduces a number of elements of the conventional crime thriller, including the itinerant dark men who hound the Kayes (but why? ), the fear of seemingly inscrutable foreigners and, of course, the dangerous burden of mistaken identity. What sets “Swinging Long Hair” apart from other episodes in the series is the causal theme of brotherhood, and the possibility of fellowship between nations. Whatever Stanley Kaye’s past, he is still as much of a musician as Johnny the jazz pianist, and his wife, loyal to a fault, provides the kind of female foil seldom seen in “Staccato” (the great exception being the episode “Fly, Baby, Fly”, which featured Cassavetes’ wife, Gena Rowlands). The fact remains that women rarely figure in Johnny Staccato – not, that is, as characters of much virtue or agency. Even the summer-replacement series 21 Beacon Street, a show exactly contemporary with Johnny Staccato and a product of the same genre, features a female criminologist (a lab technician, anticipating CSI) who provides both brains (she possesses a doctoral degree) and romantic goodness (in love with the male lead, she helps him solve cases). In contrast, Johnny Staccato gives us Mary Tyler Moore as a two-timing aspiring actress (in the episode “The Mask of Jason”), and the impenetrable, murderous Cloris Leachman (in “Solomon”). An obvious intertext with Johnny Staccato, 21 Beacon Street premiered on NBC in July 1959, and was later sold (following a 13-episode run) to ABC, where it was eventually replaced by syndicated episodes of Staccato. Before the unfurling of a show into various title-sharing derivatives became commonplace (with the versions of Law and Order and CSI like the limbs of a behemoth), the linking of 21 Beacon Street and Johnny Staccato was a method of time-share designed to help confirm the rules, and strengthen the popularity, of the private-eye genre (2). Produced by different companies for the same network, this doubling wasn’t a quirk of timing – it was a calculated business decision, a way of helping both shows. But even this tactic couldn’t save Johnny Staccato, which was cancelled after 27 episodes. Originally intended as a critique of the standard TV crime drama (and a way of departing from NBC’s earlier big hit Peter Gunn), Johnny Staccato soon devolved into a far more typical private-eye series. Whatever the core of value one may respond to in individual episodes (the exposure of forms of mind control in “Solomon”, the sideways critique of xenophobia in “Swinging Long Hair”), it’s this devolution that makes the show feel like a mainstream product. But, Cassavetes’ own comments notwithstanding, the series represents more than a mere “money job”. For the man who would soon achieve wide renown for his fresh approach to genre (tackling, among others, the gangster picture in The Killing of a Chinese Bookie  and the woman’s film in Opening Night ), the generic Johnny Staccato was unquestionably a learning experience. Viewed as a record of Hollywood’s knee-jerk recourse to mainstream fashions, it’s an instance of form trumping content. Cassavetes quoted in Ray Carney, American Dreaming: The Films of John Cassavetes and the American Experience, University of California Press, Berkeley, 1985, p. 63. For a more developed analysis see Robert Larka, Television’s Private Eye: An Examination of Twenty Years Programming of a Particular Genre, 1949-1969, Arno Press, New York, 1979. Noah Tsika, 22, is a Cinema Studies student at New York University and has a degree from Dartmouth. His interests include queer cinema, Mercedes McCambridge, and the films of Robert Altman.